Come try our delicious sushi rolls today! Osaka Sushi House offers the best Japanese food in Saratoga, NY. We offer delicious sushi rolls and other Asian food. We invite you to bring your friends and family to try our authentic Asian and Japanese food in a unique and memorable atmosphere. If you've ever been able to experience great authentic Japanese food and Sushi rolls, you know it's delicious. Once you try our authentic food, you will come back time and time again. We have a huge menu featuring great traditional Asian cuisine. Making sushi is an art to most chefs that make it. There is a practiced technique involved in making the best sushi rolls in the area. Our sushi chefs take great pride in making sure your sushi rolls are made to perfection every time. Osaka Sushi House is located in Saratoga, NY which is near Albany, NY. Saratoga Springs is known for tourism and thoroughbred horseracing. A visit to the wonderful city is like a vacation in itself. Osaka Sushi House is the "go to" place for Japanese cuisine and Sushi rolls. Our Japanese food is the best in the area! Osaka Sushi House is known for skilled sushi and sashimi masters. Our Asian seafood is brought in from fresh markets and we use only the freshest ingredients. Whether you want a sushi rolls, Japanese food or a pitcher of Sapporo at our bar; Osaka Sushi House offers you the finest in Japanese food. With so many options on our varied menu, it can be daunting to choose for your meal at Osaka Sushi House. We will be happy to help you select the perfect items from our house specialties, including Sushi Rolls, Sashimi, Pad Thai, Udon and Soba noodles, and our special one-of-a-kind rolls, always fresh and delicious. Stop in today for a nutritious and delicious lunch. Our lunch menu features shrimp and vegetable tempura or our several teriyaki dishes including chicken, beef, salmon and shrimp. All of our menu items are prepared using fresh ingredients and the best produce each season has to offer. Japanese and Asian food features healthy ingredients like seafood and vegetables. When it comes to Asian food, there are certain flavors that make it what it is. We use the freshest meats and vegetables combined with traditional Asian spices and flavors to make great dishes. Whether you come with friends or family, we're sure that everybody will find something they love on our menu. When was the last time you enjoyed a meal with fresh ingredients like asparagus, avocado, tuna, shrimp, soft shell crab or oysters? Many people have the idea that traditional Asian and Japanese fare is always spicy hot. Not true! All of our dishes and menu items are freshly prepared especially for you, so let us know if you prefer hot, medium, mild, or somewhere in between. If you are a fain of Asian food, then you are going to love Osaka Sushi House. When you choose us, you get a variety that will surely have one of your favorites. Or, if anything, a new option that can quickly become your favorite. There's no restaurant that can serve amazing Asian food like ours! 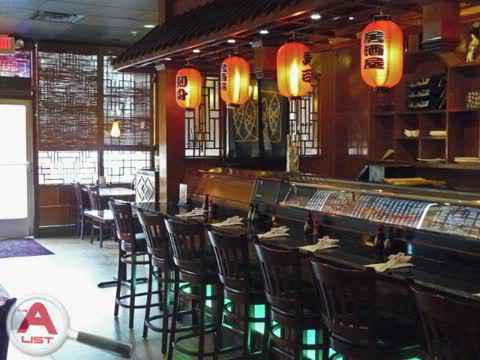 If you are looking for an Asian restaurant Saratoga, NY or the surrounding areas, we have you covered. If you are new to the cuisine or are an existing fan, we are sure that you will love our food. We bring the best of Asian cuisine to you. You can explore a great variety of both vegetarian and meat/seafood dishes that are cooked to perfection. Visit our restaurant today for delicious Asian food. Love Asian food? We serve amazing food cooked using fresh ingredients and traditional flavors. If you truly want to enjoy authentic Japanese cuisine, Osaka Sushi House - located in Saratoga, NY - is the best! Our menu features Udon and Soba noodles, sushi rolls, and more! We also have an extensive menu for seafood. To wet your whistle, you can try our sake, plum wine, sapporo, and other refreshing options. Visit us with your family and friends to savor our delicious Asian food. You won’t find a “one size fits all” philosophy here. When you are our guest at Osaka Sushi House, we will prepare dishes to your distinct taste for your enjoyment, all superbly presented with traditional Asian artistry. At Osaka Sushi House, we also offer our full menu on a take-out basis. Call ahead, and we’ll have any of our specialties prepared for you to pick up and take home for your family and friends. If there’s a party for family, friends or business associates coming up, let us do the work! We’re well-known for our catering for special events, such as anniversaries, graduations, birthdays, holidays, family reunions, or any other celebratory event. We’ll be happy to plan meal choices that will suit all the individual tastes of your guests. Call us at Osaka Sushi House and let us help plan all the details. We look forward to greeting you and your family soon at Osaka Sushi House, the place to find the best Sushi in Saratoga Springs, and beyond.